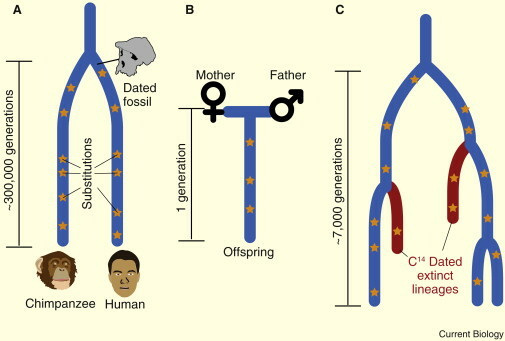 Recent analyses of de novo DNA mutations in modern humans have suggested a nuclear substitution rate that is approximately half that of previous estimates based on fossil calibration. This result has led to suggestions that major events in human evolution occurred far earlier than previously thought. Here, we use mitochondrial genome sequences from ten securely dated ancient modern humans spanning 40,000 years as calibration points for the mitochondrial clock, thus yielding a direct estimate of the mitochondrial substitution rate. Our clock yields mitochondrial divergence times that are in agreement with earlier estimates based on calibration points derived from either fossils or archaeological material. In particular, our results imply a separation of non-Africans from the most closely related sub-Saharan African mitochondrial DNAs (haplogroup L3) that occurred less than 62–95 kya. Though single loci like mitochondrial DNA (mtDNA) can only provide biased estimates of population divergence times, they can provide valid upper bounds. Our results exclude most of the older dates for African and non-African population divergences recently suggested by de novo mutation rate estimates in the nuclear genome. Figure 1 Calibration schemes for inferring the rate of molecular evolution.